Just after sunrise and just before sunset mother nature bathes the world in gorgeous soft, forgiving and even light. Now I’m guessing you’re probably not going to have your ceremony at 6am - so let’s talk timing wedding photography for the afternoon! The ‘golden hour’ of light for photographers is the hour before sunset. This is where the magic happens. 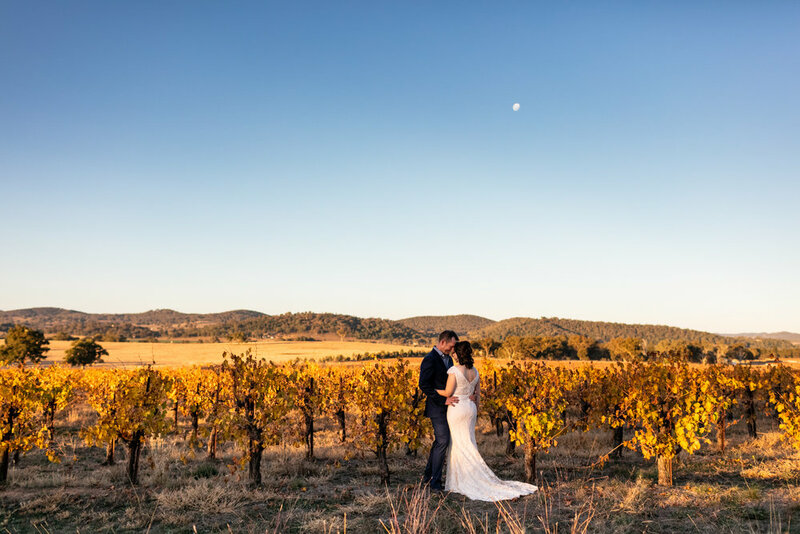 If you are getting married in spring or autumn, it can be pretty easy to time your ceremony to lead into portraits just before sunset. Working backwards from sunset helps. Here’s how to do it…. Allowing 1-1.5 hours for formal portraits is pretty standard for a bridal party of 4-6 people including the couple. Now if you are getting married in summer this can get a little tricky. A great option for summer weddings, when sunset can be as late as 8pm, is dividing your formal portrait session in two. The first session we can do after the ceremony with all of the bridal party. You’ll need at least 45 minutes for this. And then at sunset allocate 30 minutes in your reception schedule to duck out and take advantage of the spectacular golden hour light. So a summer schedule would look something like this…..
8pm - Reception continues - mains, cake cut, first dance? 6-7.30pm - Reception starts - entrees and speeches?